Active in the morning on the exterior walls of a manyatta, traditional mud-dung hut, at Amboseli National Park, Kenya. March 2011. Identification provided by Dr. Patrick K. Malonza, Senior Research Scientist, Head, Herpetology Section, National Museums of Kenya and with the help of Martha Nzisa. 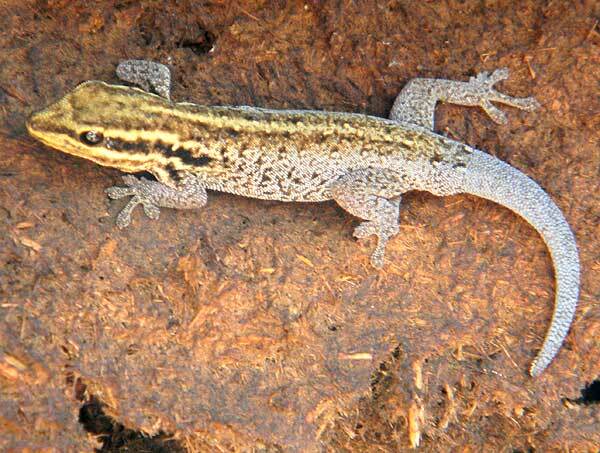 Many gecko species are active strictly at night and are therefore nocturnal. The genus Lygodactylus is instead active by day, i.e. diurnal. They feed on small insects and like their nocturnal conterparts have an extraordinary ability to walk upon verticle surfaces by means of highly specialized pads on the toes of their feet. Copyright Michael J. Plagens, page created 17 June 2011.